Knightdale Dogtoberfest kicks off in the same fashion as the inaugural event did last year, with the running (or walking) of the “2k9” Fun Run starting at noon. The run will loop around Knightdale Station Park and prizes will be given out at the conclusion of the “2k9” to the top several finishers. On top of these runners being awarded prizes, their will also be goody bags given out to the first 100 contestants that had signed up for the fun run at Knightdale Dogtoberfest. 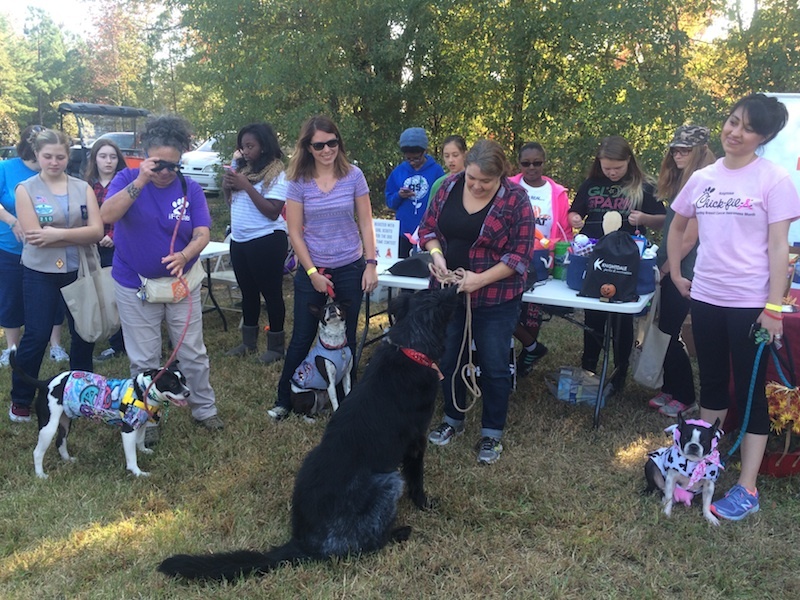 Continuing in what figure to be a Knightdale Dogtoberfest tradition, will be the return of the wildly popular dog costume contest which will also see prizes awarded in a variety of categories to the dogs that will be judged by the local girl scouts. Likewise, there will once again be a booth at Knightdale Dogtoberfest set up by the Wake County Animal Shelter (WCAS) where information and literature on how to adopt a dog will be provided. For those looking to leave Knightdale Dogtoberfest with a new pet, you will also be able to actually adopt a dog through the WCAS as well. Several other pet related vendors will also be on hand to share in this day dedicated to the dogs. Heading into the fall season, Knightdale Dogtoberfest is just one of the many great community and family friendly events that the Town of Knightdale will be holding at Knightdale Station Park. You can find a full listing of the events coming up at Knightdale Station on their events page at knightdalestation.com or for a full listing of all the great upcoming events this fall and into the winter visit the official Town of Knightdale website at knightdalenc.gov. 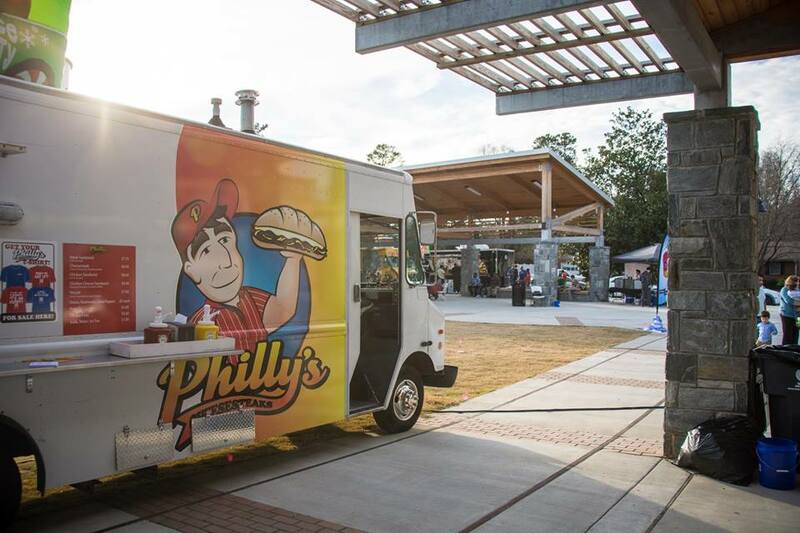 With the overwhelming popularity of the same events in the Spring and Summer, both dinner and lunch will be served at Knightdale Fall Food Truck Thursdays starting on Thursday, September 1, with a variety of tastes available each week at Knightdale Station Park. Building on the initial success of the once weekly events held at Knightdale Station in its first go around, last Spring and Summer, the Knightdale Food Truck Thursdays expanded to have trucks both during lunch hours and a completely different truck on site for dinner hours. With the great response from members of the community, the Town of Knightdale will this trend will continue for Knightdale Fall Food Truck Thursdays, as the lunch hours each week will see the trucks serving up delicious fare from 11:00 a.m. until 2:00 p.m. and the dinner hours will be from 5:00-8:00 p.m.
Knightdale Food Truck Thursdays are held rain or shine near the amphitheater at Knightdale Station Park. 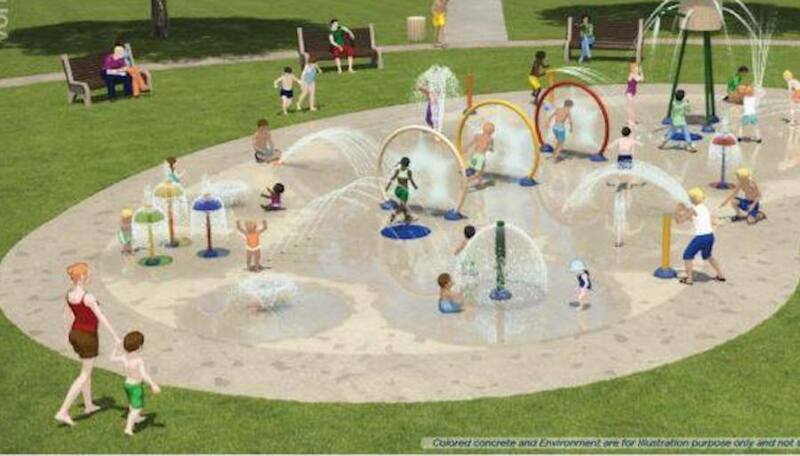 For more information on these and all other great Town of Knightdale events visit knightdalenc.gov. This Friday night, August 26, one of the most popular family events of the season returns to Knightdale Station Park, as Knightdale Outdoor Movie Night kicks off with a showing of the science fiction hit, “Avatar” playing on the big screen beginning at dusk. With the Summer series proving once again to be a fun and entertaining night out for area families, the Knightdale Outdoor Movie Night series has four scheduled showings to take place on Friday evenings through the first week in October. 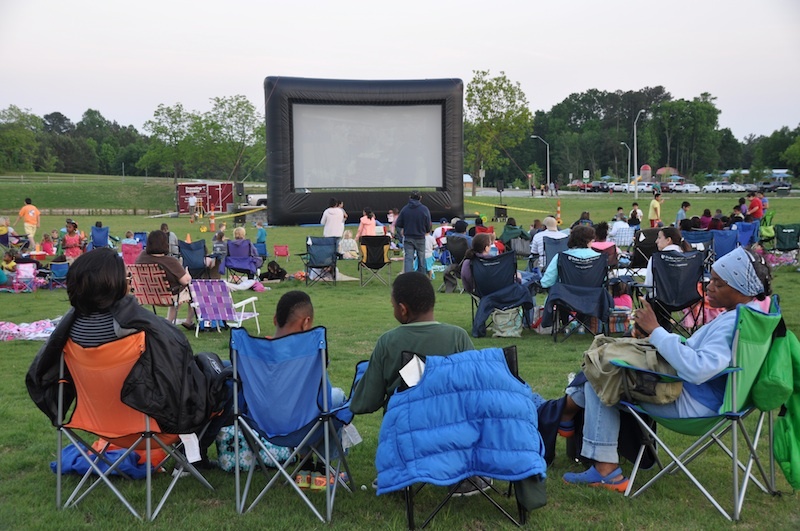 The Knightdale Outdoor Movie Night events are completely free to the public and all are encouraged to bring either a blanket or chairs to sit on as they enjoy the movie. There will be vendors on hand serving up refreshments at Knightdale Outdoor Movie Night, and this fall there will be added incentive to grabbing a bite to eat or a drink at the events this fall, as groups from local schools will be running the concessions and all proceeds will go directly to the school on hand that evening. The Hodge Road Elementary PTA will be at the Friday, August 26 showing of Avatar, so having a snack or any type refreshment at the event will not only curb your hunger or thirst, but it will also help our area schools throughout the Knightdale Outdoor Movie Night series. Additionally, the Cub Scout Pack 365, which meets right in Knightdale every Tuesday night at the United Methodist Church will be on hand volunteering their time to help with each Knightdale Outdoor Movie Night. If you have a youngster interested in finding out more about this great organization, you can visit them at any of the movie night events, or go to their website at beascout.org. For more information on the upcoming Knightdale Outdoor Movie Night series, including sponsorship visit knightdale nc.gov. With all of the fantastic family friendly and community based events held throughout the spring and summer months by the Town of Knightdale at Knightdale Station Park, residents can rest assured that the good times will continue to roll into the next season, as on Thursday, August 4 the Knightdale Fall Concert Series will kick off, bringing a fun filled night of music to the stage on the first Thursday of each month through October. 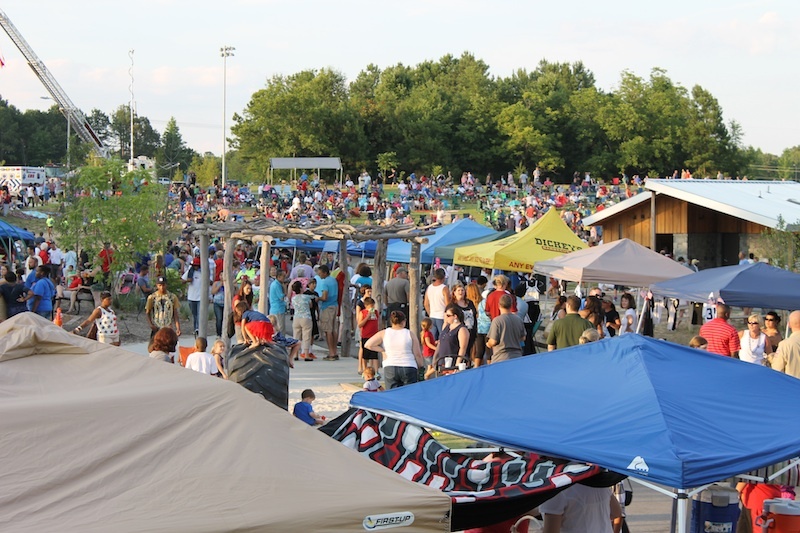 This will be the inaugural year for the Knightdale Fall Concert Series, which figures to become the next “Knightdale tradition” to be started and held at Knightdale Station Park. Following on the heels of the great success the town has had with such great recurring events as the Knightdale Farmer’s Market, the popular Food Truck Thursdays or Food Truck Rodeo events, and of course the annual Fourth of July Celebration, which has drawn in access of 10,000 area residents to the park, the Knightdale Fall Concert Series is sure to be a great time for family members of all ages. The weekly live performances as a part of the Knightdale Fall Concert Series will start at 6:00 p.m. and run until 9:00 p.m. Admission is completely free to attend the concerts, but there will be various activities for the children and food trucks on hand, both of which will be additional costs. The Town of Knightdale encourages you to bring chairs or a blanket to set up for comfortable seating. The Knightdale Fall Concert Series is sponsored by Go Triangle and for further details on this and all upcoming Town of Knightdale events visit knightdalenc.gov. 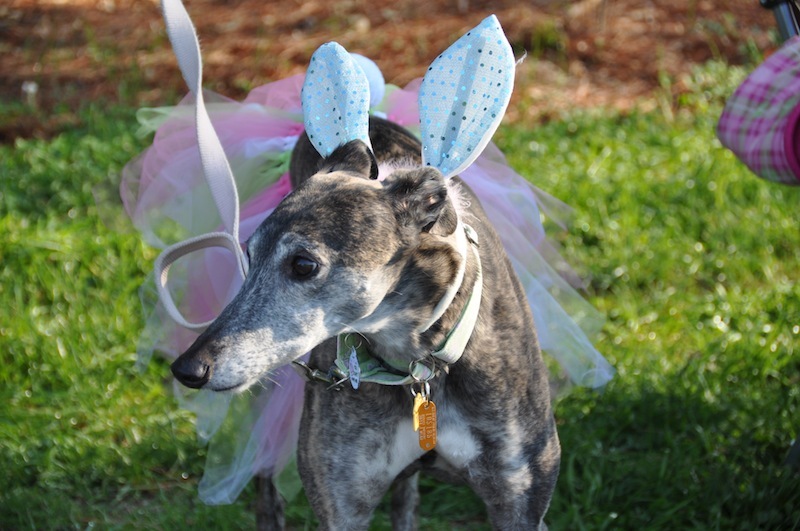 Continuing this Spring to bring the families and even the pets of the community together for a great time for all ages, this Saturday, March 19, Knightdale Station Park will play host to two fantastic Knightdale NC Events, Paws in the Park and Easter Eggstraordinaire. Hosted by the great folks at the Knightdale Parks and Recreation Department, the Easter Eggstraordinaire has become an annual tradition among Knightdale NC events, hosted on the Saturday prior to Good Friday each year. This fun filled day of Easter-themed activities for the kids will offer up egg hunts for three different groups, with the age ranges being from 0-3 years, 4-5 year olds, and also 6-8 year olds. The egg hunts as part of the Knightdale NC Events this Saturday will take place in the beautiful grassy area near Knightdale Station Park Amphitheatre and signs will be up to help direct each age group to their respective areas. In addition to the egg hunt, there will also be an appearance by the Easter Bunny for photo ops as well as many other activities and music for the entire family to enjoy throughout the festivities. Both Kona Ice and C &J Funnel Cakes will be on hand serving up treats throughout the day’s events. The Easter Eggstraordinaire will begin at 10:00 a.m., with the egg hunts starting at 11:00. The children will not be the only members of the family enjoying the Knightdale NC Events this Saturday, as “Paws in the Park” will also be taking place, giving your pets a “day for the dogs.” “Paws in the Park” will kick off at 9:30 a.m. at the Ashley Wilder Dog Park at Knightdale Station Park and the first 120 dogs registered will receive both a Frisbee and a goody bag filled with treats. All dogs must be kept on a leash, non-aggressive, and have up to date rabies tags or a certificate to register for the “Paws in the Park” activities. For more information on these and other great upcoming Knightdale NC Events, visit the town’s website at knightdalenc.gov. To get more information on all the great things going on at Knightdale Station, including new homes and lot pricing, visit knightdalestation.com.